Besties that slay together, stay together! For Louis Vuitton’s Paris Fashion Week show on Wednesday, October 5, Karlie Kloss added freshly-cut bangs to her blonde lob for fall 2016. The L’Oréal Paris brand ambassador, 24, shared her new hairstyle on Instagram (of course!). “ending #PFW with a bang  ,” she wrote on October 5, giving major smize in front of a plate of croissants while holding a teacup. Kloss, who wore a red, white and blue asymmetrical hem dress with a deep-V neck and ab cutotouts to the show, also flaunted her style in another Instagram alongside Miranda Kerr. “kiss kiss bang bang,” she captioned. 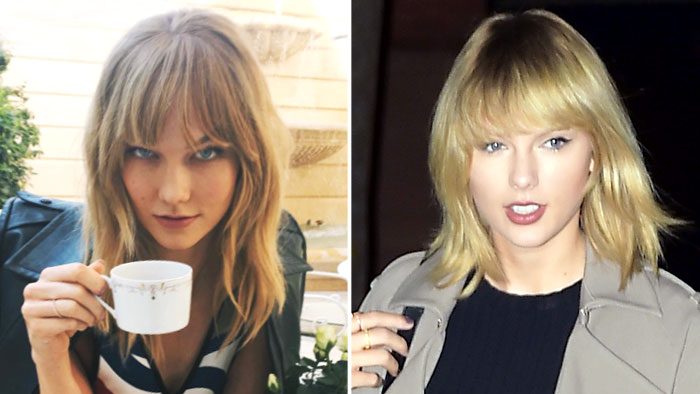 Kloss’ fringe is yet another hair change that the model has shared on social media. In July, she joined the ranks of Lucy Hale and Emma Stone by dyeing her locks platinum blonde. “I’m already having more fun,” she captioned a selfie that displayed her shade.